An HRSG (heat recovery steam generator) used in a combined cycle power station or cogeneration power plant is an essential element for energy production in these plants. It is imperative to maintain the HRSG component during layups while at the same time limiting its exposure to oxygen and keeping it free from corrosion that can be detrimental to the overall performance of the HRSG and the power plant. In fact, proper maintenance of the HRSG can be the best determining factor of the longevity and reliability of the plant. When a power plant undergoes regularly scheduled layups for maintenance and upgrades, the HRSG must be properly maintained. One of the biggest dangers during this time is exposure to oxygen which, when mixed with moisture and steel, can quickly cause corrosion, or oxidation. Preventing this exposure to oxygen is imperative to maintaining the integrity of the unit and extending the life of the power plant. Chemical inhibitors have traditionally been used to prevent block the introduction of oxygen. However, these materials can be dangerous to handle and harmful for the environment. An alternative to using chemical inhibitors is to use clean, dry, inert Nitrogen gas pumped through the tubes and wetted parts. This process of inerting the HRSG using Nitrogen gas is a reliable and environmentally friendly solution to preventing oxidation and corrosion. A Nitrogen Generator is a safe and cost effective alternative to using high pressure N2 gas cylinders to deliver Nitrogen to the system. Nitrogen Generators are installed one time, are easy to maintain and operate, and are extremely effective at preventing corrosion. South-Tek Systems engineers and manufactures Nitrogen Generators for use in a wide variety of applications and industries, including the energy industry. They have knowledge and experience fitting Nitrogen Generators with power plants (See: South-Tek Systems Supplies Nitrogen Generators for Power Plant). Contact South-Tek Systems today to learn more about how a Nitrogen Generator can benefit your operation: 888-526-6284. Power plant outages occur when one or more power generation units have to shut down for routine maintenance, repairs, or upgrades. It is inevitable in the life-cycle of a power plant to have shutdowns or outages but there are concerns for the preservation of the equipment during these layup stages. What Happens During A Power Plant Layup? When a power plant boiler is drained for maintenance or upgrades, residual water will likely remain in the boiler tubes and condensers. This water will mix with the oxygen from the air it is exposed to during the layup and any worn or scratched parts of the steel tubing that are affected by this mix are immediately susceptible to corrosion, or oxidation, of the tubing. This corrosion of the wetted parts of a power plant that occurs during outages and layups can cause pinhole leaks, threatening the integrity of the parts, leading to further damage and costly and time consuming repairs. Once the process of corrosion begins, it spreads rapidly throughout the susceptible parts of the system. These are the parts that mix unprotected (scratched or worn) steel tubing, moisture, and oxygen. Galvanic corrosion and microbiologically influenced corrosion can both spread quickly and cause real damage to the inner workings of the power plant. Power plants and their susceptible parts can be protected from the development of corrosion during outage and layups. One solution is to inert the wetted parts (boiler tubing, condensers, etc) using Nitrogen gas. The process of inerting will displace the oxygen with Nitrogen, eliminating an environment where corrosion can occur. Nitrogen is a clean, safe, inert gas that can be provided conveniently and reliably by a Nitrogen Generator. South-Tek Systems is an engineering and manufacturing company dedicated to Nitrogen Generators. They possess the knowledge and experience to apply the use of Nitrogen Generators with power plant facilities (See: South-Tek Systems Supplies Nitrogen Generators for Power Plant). A Nitrogen Generator is a cost effective, safe, and reliable alternative to high pressure N2 cylinders. Not only are they an environmentally friendly choice, but, once installed, they require minimal maintenance. They use a simple PSA Generator technology that produces Nitrogen literally from the air around us. South-Tek Systems can fit your power plant facility with a properly sized Nitrogen Generator for your needs using the unique Flow Verification Program. Contact South-Tek Systems about a Nitrogen Generator for your power plant facility and protect your equipment from corrosion during outages and layups: 888-526-6284. Corrosion of wetted parts in power plant facilities - such as in boiler tube inner walls and condensers - presents a very real threat to the performance of the entire power plant. Corrosion, or oxidation, can compromise the integrity of the boiler tubes and condensers resulting in leaks, cracks, and, ultimately, failure. It is crucial to implement power plant corrosion control to protect the wetted parts, reduce costly and time consuming maintenance, and optimize the performance of the facility. How Does Power Plant Corrosion Occur? The most common area for corrosion to develop is within the wetted parts where all three of these elements come into contact. Steel tubing that is exposed to moisture from water and oxygen from the air will develop oxidation or galvanic corrosion. When a power plant boiler goes through a drain-down for repairs or maintenance, it is inevitable that both residual moisture will remain and the tubing will be exposed to oxygen from the air. The result is the ideal formula for the development of corrosion. One solution to prevent the development of corrosion is to use inert nitrogen gas to displace oxygen. Nitrogen gas pumped through the system works to eliminate oxygen AND absorb moisture to prevent the development of corrosion. Nitrogen is an inert, clean, dry gas that has become a more popular alternative to chemical inhibitors because it is an environmentally friendly option. There are two ways to obtain a Nitrogen gas supply: high pressure gas cylinders and Nitrogen Generators. Nitrogen Generators are the optimal choice because they produce a steady stream of nitrogen gas, on-site and on-demand. Once you install a Nitrogen Generator in your facility, there will be no change-outs, no gas company contracts, and only minimal maintenance. They are a safe, reliable, and cost effective option for power plant corrosion control. South-Tek Systems engineers and manufactures Nitrogen Generators for use with various applications across a variety of industries, including Power Plants. They have direct experience in this field (see: South-Tek to Supply Nitrogen Generators at Combined Cycle Power Plant) and can assist with designing and providing the ideal generator for your plant - from a small industrial boiler, to an HRSG combined cycle power plant, to a large gas, oil, or coal fired power plant. Contact South-Tek Systems today to talk with a knowledgeable representative about Nitrogen Generator use with power plants: 888-526-6284. Boiler tubes used in power generating plants and the heating and ventilating industry are part of the tubing components of utility and industrial boilers. The boiler tubes are generally constructed of steel, are heated and exposed to water within the boiler to generate steam. In the case of a power generating plant, this steam plays a vital role in the production of electricity. Due to the construction and use of power plant boiler tubes, these integral pieces of equipment are susceptible to corrosion resulting in poor performance, costly repairs, and, ultimately, failure. Why Are Power Plant Boiler Tubes Affected By Corrosion? The combination of steel, water, and dissolved oxygen in the boiler water initiates the corrosion, or oxidation, of the boiler tubes. 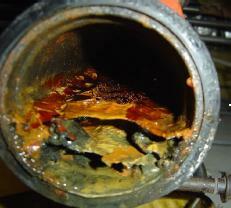 This corrosion leads to grooving in the tubes and eventually cracking that causes the failure. Although the boiler is a closed vessel, it has been found that oxygen is introduced during the addition of water (make-up water) after a drain down for interior projects or repairs. This water treatment method aerates the boiler water and actually promotes boiler tube corrosion. The elimination of one of the above elements - steel, water, or oxygen - can help prevent this type of corrosion and damage to the power plant boiler tubes. Since steel is the optimal material for boiler tube construction because of its ability to handle heat and water is of course necessary to the power generating process, it would be ideal to eliminate oxygen from this equation. One solution for eliminating oxygen is to inert the atmosphere in the boiler using nitrogen. Nitrogen inerting works to displace the presence of oxygen in the vessel with nitrogen gas. Nitrogen is a clean, dry, safe gas often used for the purpose of eliminating oxygen where the presence of oxygen can cause either combustion or corrosion. South-Tek Systems designs and manufactures Nitrogen Generators for the purpose of purging and inerting for a wide variety of industries and applications. Nitrogen is a safe, reliable, cost effective solution for maintaining power plants to keep them running smoothly and efficiently for maximum performance. Nitrogen Generators provide an easier and more ideal alternative to high pressure nitrogen cylinders. A generator can safely and reliably produce high purity N2 gas on-site and on-demand for a fraction of the cost of the managing high pressure cylinders. Contact South-Tek Systems today to learn more about our solution to prevent boiler tube corrosion: 888-526-6284.